MW100 records solar power parameters such as radiance, ambient temperature and before/after electric conversion power data. Power data after electric conversion using power meter record by communication (digital data can be more accurate). 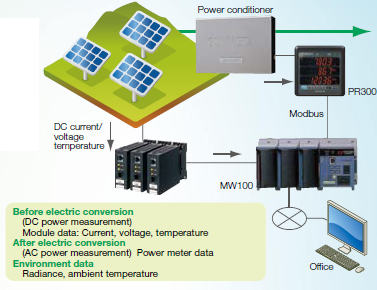 Some inverters have direct Modbus output. Data recorded simultaneously to CF and network (OPC). Even after power failure recovery failure, MW100 continues to record data.